As a so-called menu option in the scheme of meaningful use requirements, this provision figures to cause consternation in HIM departments and physician practices. The wait is over. The 25 stage 1 meaningful use criteria that were hanging in the balance for months were officially introduced in July, and now the healthcare industry is quickly trying to grasp the nature of how this piece of the HITECH Act will shape the future of widespread EHR adoption across the country. And as providers try to wrap their heads around what the final criteria will mean in terms of cost and workflow changes, one requirement has stood out as particularly challenging to a number of HIM professionals. The final rules regarding timely access have been toned down from their original form following the comment period in which concerns were raised over EPs’ ability to comply. Previously, the criterion required access within 96 hours and was all encompassing as far as which EPs had to comply. The criteria now are broken down into two categories: the core set and the menu set. While all EPs must comply with the core set of objectives, they may now choose up to five from the menu set, where the timely access option currently resides. Aviva Halpert, MA, RHIA, CHPS, chief HIPAA officer at Mount Sinai Medical Center in New York, says it’s not just EPs who lack readiness; vendors are also behind the curve. And many in the industry are looking to this group to provide the basis for making the criteria happen. McLendon notes that many of his clients have not honed in on the challenges that could potentially accompany the ability to create timely access to patient data. In fact, he suggests many are just beginning to come to terms with the need to get an early start on meaningful use preparations. For help in meeting these criteria, numerous EPs will look to their EHR vendors, many of which are not ready to provide an avenue for meeting this need, according to Halpert. Hospitals have an advantage in that they have IT departments available to brainstorm and create solutions. The average physician office does not have these resources to draw on. Another concern, according to McLendon, is timeliness in taking action. Because EPs will have to show three months of continuous meaningful use to meet incentive requirements, he says providers should be ready to start by September of next year. 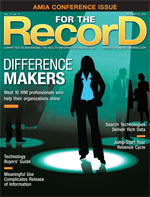 “There is going to be a rush of physicians trying to get [meaningful use] in place next year. Vendors aren’t going to be able to handle it,” McLendon explains. To begin getting ready to specifically meet the timely access menu choice, EPs will need to first identify which patients they are going to target. “Who is going to be most open? What are you giving them … what are you trying to offer them?” McLendon says, suggesting that these are all questions EPs should be asking now. Along with targeting an appropriate patient population, EPs must quickly identify how they will keep track of this provision for reporting purposes, McLendon says. HIM departments will also need to align their processes with the new expectations, according to Fannin, who suggests the greatest initial adjustments will center on the need for a mindset change geared more toward consumerism. The electronic provision of medical records to patients as a way to share clinical data is not common practice in the industry today; it’s traditionally been handled by making paper copies of the records and handing them to the patient. Departments that are working in a hybrid mode—with both an EHR and paper documentation—are going to have additional challenges in meeting these requirements, Fannin adds. Specifically, patients must have electronic access to their health information, which means all paper-based data must first be entered into the EHR before being made available to the patient. Scanned documents will also make it challenging for the EHR to format the information into a practical and understandable “document” for the patient. Besides internal readiness, Birnbaum has identified several potential conflicts with the provision as it relates to state law. Specifically, in California, all lab results have to be reviewed before they can be released electronically to patients. As EPs begin distributing patient data either by electronic interchange or by handing patients a CD, proper encryption will become paramount. As a result, healthcare organizations must add layers of security technology, McLendon says. Halpert adds that meeting the conditions of timely access raises questions as to who becomes responsible for the security of data sent by e-mail or contained on a CD. “With paper records, once I hand the information to a patient, it’s not my problem,” she says, adding that software interoperability between physician and patient looms as another potential hurdle to clear. In the case of an organization such as Rady Children’s Hospital, the largest source of comprehensive pediatric medical services in San Diego, security becomes even more complex. In most cases, the information is released to the legal guardian, but in others, minors have the right to withhold information from their guardian. EHRs will bring EPs and patients many benefits—industry professionals readily acknowledge that point. But when it comes to the initial investment and the ratio of incentive money to time and cost issues associated with getting ready for criteria such as the timely access option, many experts believe breaking even will be an EP’s best hope. Fannin points out that the capability to meet the needed functionality necessitates providing patients with a publicly accessible application such as a patient portal or an integrated PHR. “A patient portal oftentimes will offer a PHR along with other useful features for both the patients and the practice. There are also multiple products that offer free or inexpensive personal health records as part of their solution, including Microsoft HealthVault and Google Health,” he says. Fannin cautions that patient portals and PHR products must be able to integrate with the populating EHR to be considered an effective solution for meeting the timely access requirement. ”Stand-alone patient-facing solutions that are not integrated into the practices’ EHR will have difficulty being a realistic solution for this menu item,” he says. Industry statistics suggest that while the cost of EHR products vary widely, the initial investment plus maintenance will on average cost a physician practice about $43,000 over a five-year period. Meanwhile, the maximum incentive for EPs is $44,000. Still, many view the timely access requirement as further evidence that consumers are becoming more empowered when it comes to managing their health information. “This is very important to consumerism in the industry … and where the country needs to move toward engaging patients,” Barnes says.